Despite being home to an extraordinary number of bicycles, the very best of Cambridge is actually just a minute or two’s walk from this city centre hotel. 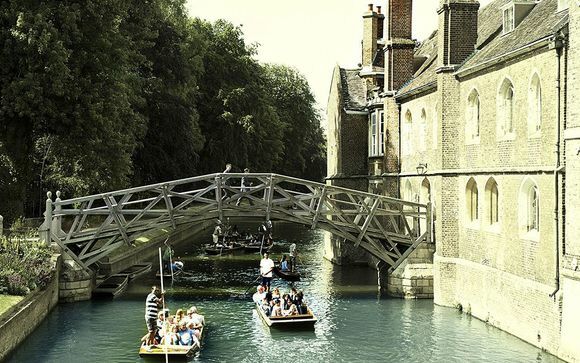 King’s College, The Fitzwilliam Museum, Cambridge University Botanic Garden and Trinity College plus punting excursions and beautiful waterside walks along the River Cam are also very close by, and top the list of things to do in Cambridge during your stay. So too are many other fine museums, buildings and art galleries. Explore shops in ancient passageways set around the historic market place and colleges. And come nightfall, with everything from international pop concerts to world class Theatre competing with a huge choice of restaurants and welcoming pubs and clubs, you’re never far from the best events and brilliant entertainment in Cambridge. All 198 of the stylish, contemporary air-conditioned rooms and suites at Cambridge City Hotel offer a full Sky satellite HD TV service, and free Wi-Fi is streamed throughout our Hotel. Together with self-contained conference and event facilities, guests of the 4 star Cambridge Hotel also benefit from on-site Valet car parking, and exclusive use of a gymnasium with sauna. 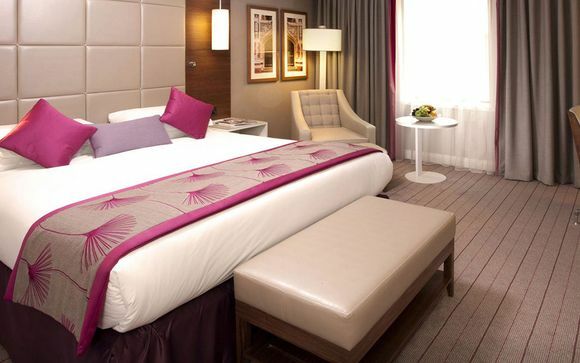 This offer is based on an Executive Double Room with Kingsize Bed. Stylishly decorated in warm welcoming tones and fully air conditioned, the Cambridge hotel rooms give you the space you need to work, relax - or perhaps, do both. Free Sky satellite HD TV in every room, with Sky Movies and Sky Sports, breaking news and a fantastic choice of all round entertainment also adds to the comfort of your stay whilst you’re away from home. All rooms at Cambridge City Hotel offer generously sized double beds, luxurious en suite bathrooms, and complimentary mineral water, coffee and tea. Settle in, make yourself at home, and whether it’s business or pleasure, enjoy your time here. This offer is based on a bed and breakfast stay which includes a daily full English breakfast. Just for you: glass of prosecco on arrival. Sink into a comfortable chair in the Bar and enjoy one of our speciality coffees, freshly prepared lunchtime bar snacks or indulgent afternoon teas. It’s a great place to meet up with friends or wind down with colleagues over a cocktail, beer, or glass of wine. You may prefer to take yourself next door to Quinns Irish Pub, which together with traditional pints of Guinness and a variety of other well known beers, wines and spirits also serves light bar snacks and tasty meals. Come on in and enjoy a warm welcome and a buzzing atmosphere - especially on Saturday Karaoke nights. There’s Sky Sports too, showing all the big games. It’s right next door, so you’ve really no excuse not to sample Quinn's unique brand of “craic”.